[0:55] <Tenkawa> what are PI's?? [2:33] <SwK> Order $242.75 more to get a free Raspberry Pi. [2:34] <buzzsaw> I am looking for a good wifi card for the rPi any recomendations? [2:38] <epoch_> Has anyone gotten Texas Instrument calculators working with a Raspberry Pi? [2:47] <eggy> Edimax EW-7811Un seems to work well. [2:51] <SwK> I keep trying to figure out if I have a reason to try and make this work lol ": Order $242.75 more to get a free Raspberry Pi." [3:01] <eggy> I don't know why it happens. [3:09] <epoch_> Would using an AT power supply for a RasPi be a bad idea? [3:10] <epoch_> I measured the 5v output and it was 5.5 I think. [3:11] <epoch_> I'll try a couple different supplies for a more 5v 5v output than 5.5v. [4:31] <zproc> anyone tried XDMCP from a pi ? [4:44] <buzzsaw> I take it rpi shipping is still behind? [4:48] <buzzsaw> why are you beating your head on the table? [4:52] <SwK> breadboard good wait 4 weeks for oshpark and !@#!K$@#$$@#!!!!!!!!!! [5:01] <buzzsaw> does it have anything to do with the shorting? [5:11] <buzzsaw> hum... I need GPS data for my rPi any sugestions? [5:13] <epoch_> The only stuff I hear about GPS is that ESR was trying to get some cheap GPS thing made. [5:18] <epoch_> GR-600. haven't found a price for it yet. [5:20] <buzzsaw> I have not ordered one yet "just about to" has anyone played with the wifi in rfmonitor mode yet? [5:23] <buzzsaw> I know debian and kali run but what other distros have people played around with? [5:23] <SwK> http://imgur.com/a/zPZyp IO board even??? [5:24] <epoch_> buzzsaw, I'm using Arch right now. [5:28] <SwK> edman007: what gyro are you using? [5:29] <epoch_> fr0g911, what's the IRC server? [5:32] <SwK> are you in the states? [5:34] <buzzsaw> fr0g911: get what? [5:35] <epoch_> I'd install BSD on my Pi but I don't have another thing that can do a 3.3v serial console. [5:38] <SwK> where'd you get that gyro for $17? [5:45] <SwK> Essobi: oh making pretty stuff http://i.imgur.com/Zg7VIIp.jpg thats pretty right? [5:45] <Essobi> SwK: you compiled fs on a marvell kirkwood yet? I got one working with a dev environment up now. [5:46] <SwK> Essobi: those resistors are legit looking eh? [5:48] <SwK> Essobi: what arch are those thing? [6:02] <Essobi> Pretty nifty box for $150. [6:03] <Essobi> I'm slowly reversing everything on it. [6:03] <Essobi> And it's sata based so it's fast on the iops. [6:04] <Essobi> 1G/128mb/16mbflash and add your own sata. [6:05] <Essobi> Screen is woa, thou. [6:06] <Essobi> Hmm. sata 3.0? [6:08] <Essobi> SwK: This kinda hot but I wish it had a box. [6:08] <Essobi> I need like 3K units so..
[12:30] <Bochi> mgbowman: what did you order? [12:31] <Bochi> also, is it possible to use the PI as a controller for boblight or is the controller board still required? [12:35] <Bochi> mgbowman: but aren't strips required around the TV? [12:35] <gordonDrogon> is that when you put the rgb strips at the back of the TV? [12:35] <Bochi> or is it a one strip solution? [12:36] <gordonDrogon> some of the RGB controllers are clever. [12:36] <gordonDrogon> just make sure the strip you use is Pi compatible - not all are. [12:36] <gordonDrogon> some have weird timings that just won't work on the Pi. [12:39] <mgbowman> but my strips are still "out for delivery"
[12:39] <mgbowman> Bochi: you think so? [12:42] <mgbowman> Bochi: so what interesting things have you done with your pis? [12:52] <wxcafe> anyone has a clue? [12:57] <mgbowman> wxcafe: can you demsg | grep wlan0 ?? [13:00] <parasciidic> quick question about rpiconfig - what do particular values in config_hdmi_boost mean? [13:00] <mgbowman> yay! led strips are here! [13:04] <tinti> any RTOS facilities suggestions for Linux? [13:05] <dreamreal> the TX and RX pins are accessed in raspbian via /dev/ttyAMA0, right? [13:08] <wxcafe> what do you mean, the dev? [13:15] <mgbowman> no decent 10A power supply at conrad! [13:22] <epoch_> dreamreal, connect another pi to the other end and see what comes back? [13:23] <epoch_> Also, gotta make sure to disable anything else that might be using the port. A lot of distros have a serial console for the Pi enabled by default. [13:23] <phw> I want a fullscreen application for a 170x120 display (framebuffer). What gui toolset is suitable for such small displays? [13:29] <mgbowman> Bochi: will report back if I manage to get the leds lit! [13:34] <gordonDrogon> tinti, FreeRTOS has been ported to the Pi IIRC. [13:34] <tinti> gotdonDrogon: really nice. Thank you. [13:35] <gordonDrogon> tinti, I'd suggest that even with that it's not the best platform for 'hard' real-time control though, but it might work for you. [13:36] <gordonDrogon> you might want th stick to Linux then... makes it easier to program if nothing else! [13:37] <dreamreal> mgottschlag: what's the best way to test that programmatically? [13:39] <dreamreal> mgottschlag: and just connect rx directly to tx? [13:41] <gordonDrogon> let me know how. [13:41] <gordonDrogon> as its something I keep getting asked. [13:42] <gordonDrogon> it's not a standard divider that unix knows about - from what Iv'e read you need to change the clock divider frequency that drives the uart and maybe other things too. [13:42] <gordonDrogon> I'm actually considering putting together a little addon board with a pair of uarts fixed to sandard midi baud rate. [13:43] <gordonDrogon> then logout/login again. [13:43] <gordonDrogon> let me check it then..
[13:45] <gordonDrogon> ok. my knowledge was a bit old then - I suspect that's relatively new! [13:45] <mgottschlag> dreamreal: what rights/owner/group does that file have? [13:46] <dreamreal> which file? /dev/ttyAMA0? [13:47] <gordonDrogon> dreamreal, or are you running something other than Raspbian? [13:50] <gordonDrogon> A124, run less programs on it then. [13:51] <A124> gordonDrogon: Um.. What Should I kill then? [13:51] <dreamreal> so with echo off, running minicom should give me the content as I type it, right? [13:51] <gordonDrogon> dreamreal, if you loop tx^rx ..
[13:52] <gordonDrogon> A124, it's not a microcontroller - it's a Linux PC. Expect it to use more memory, need more resources ..
[13:53] <gordonDrogon> A124, you just need to learn to work with those resources. [13:53] <gordonDrogon> A124, 11MB to run X11 in? Well done. [13:54] <gordonDrogon> dreamreal, it's unlikely to show on a multimeter. [13:55] <dreamreal> A124: on the pi *now*? [13:55] <gordonDrogon> dreamreal, if minicom isn't echoing characters then there is something amis. [13:55] <athanor> Plenty of gui for RasPi. I just put Bodhi on a VM, and strongly considering trying it on the Pi. It feels so smooth on here (until I open a Java IDE, which I'd never try on the Pi). [13:55] <gordonDrogon> ARM instruction set might not be as efficient as x86 instructions, so might need a bit more RAM. [13:56] <mgottschlag> dreamreal: what exactly did you connect? [13:56] <mgottschlag> just a wire from one pin to the other? [13:56] <gordonDrogon> dreamreal, I just put a jumper between tx & rx and run minicom - baud rate doesn't matter, but turn off hardware handshake. [13:56] <gordonDrogon> dreamreal, there's also a test program in wiringPi if you want. [13:57] <dreamreal> I don't know what the value of unused ram is, honestly; unless you need it for something else, why worry about it? [13:57] <dreamreal> A124: sure, and your consequence. Fix it! [13:57] <gordonDrogon> so live with it. [13:58] <gordonDrogon> dreamreal, try a string of control-@'s. [13:58] <parasciidic> any reason for xorg to crap out when i'm opening a window in fluxbox on raspi? [14:03] <gordonDrogon> Ah, if you're using millis() or delay() then you do need a wiringPiSetup() and you can use wiringPiSetupSys() if you don't want to be root. [14:04] <gordonDrogon> I2C for midi? [14:08] <Hodapp> wow, usbip has been in the mainline kernel and I never realized. derp. [14:11] <Hodapp> Julius-ZM: Sorta. Look into berryboot. [14:11] <Julius-ZM> Thanks a lot! [14:13] <ShiftPlusOne> Not quite getting the question. What's the concern? Why can't you just download the source from github and compile it with the settings you need? [14:13] <Hodapp> I'm avoiding building an entirely new kernel. [14:14] <ShiftPlusOne> You want to just build the module and want to make sure that it works with existing module then? [14:14] <Hodapp> I want to use the module. [14:16] <ShiftPlusOne> you _should_ be fine just downloading the kernel from github, copying the config from /proc, enabling the module, compiling and copying the module across. It might not be that easy though. I usually prefer to build the kernel and modules at the same time if I can help it. [14:16] <gordonDrogon> dreamreal, using your own code? [14:22] <gordonDrogon> A124, there's really no point complaining here about lack of memory, or memory bloat by applications. Compliain about generic linux (on other forums, etc.) if you want to complain about that. We here mostly just accept what it is - a nice little ?30 Linux PC and get on with it. [14:25] <gordonDrogon> hard to do that on something more general purpose though. [14:25] <Hodapp> There were guides on tldp.org about how to boot Linux on 2 MB laptops. Run old old Linux all you want. [14:26] <gordonDrogon> A124, you're saying to those who know though - we know this and live with it. [14:26] <gordonDrogon> oh you want an argument? [14:27] <A124> Can't you just throw it off? [14:27] <gordonDrogon> A124, this is a family friendly channel and that gets you a warning. [14:27] <A124> Warning for what? [14:27] <A124> I don't want any argument. [14:27] <gordonDrogon> not using family friendly language. [14:27] <A124> You keep pushing me. [14:27] <A124> Oh my friendly god? [14:28] <A124> That's not friendly? [14:28] <Hodapp> That's not what "omfg" stands for, and you know it. [14:28] <gordonDrogon> just drop it, ok? [14:29] <A124> Some people here are trying to be contructive, while some are going to conceal it in 'you can't say whether I'm polite or not' bombardment or poking possibly generating a dispute. [14:30] <dreamreal> I'm trying to be constructive in saying "fix it and stop complaining"
[14:30] <gordonDrogon> indeed. you're complaining about the size of programs on the Pi. We know this. It's not going away. Deal with it. [14:30] <gordonDrogon> or fix it. [14:30] <A124> gordonDrogon: First you poke me again and again, and then after not dropping it when asked, you continue and later asking me to drop off? [14:31] <gordonDrogon> nothing to stop you compiling your own. [14:32] <ShiftPlusOne> Why are we ganging up on A124 here? [14:32] <A124> Only you, gordonDrogon and dreamreal was actually hitting without no reason. [14:32] <Hodapp> I fail to see how we are. [14:32] <gordonDrogon> Who? I'm ignoring him now. [14:32] <dreamreal> How is anyone "hitting" you? [14:32] <Hodapp> He's like that hotwings doof that kept PMing me and telling me that I was going to get banned. [14:33] <ShiftPlusOne> I don't think I said anything... I was just jumping in to point out that people are ganging up on you for no reason, but hey. [14:34] <Hodapp> I don't think I provided any, but nice try. [14:34] * ShiftPlusOne is confused and goes back to doing whatever it is he does. [14:34] <Hodapp> wait a minute, why am I pulling the entire git repo just to get one specific kernel version? [14:34] <Hodapp> these instructions seems a little unneeded. [14:35] <A124> dreamreal: Your feedback to rate as constructive rates for a retarded person. [14:35] <A124> At least for me, sorry for that. [14:37] <Hodapp> that is a LOT to transfer over my tiny connection when I could just get a ZIP file of the latest rev. [14:37] <A124> I even appologize and you still have the urge. I'm ingoring any unconctructive saying from your side from now on. It's just useless spamming and killing. [14:37] <dreamreal> and now we have the first evidence of killing via irc! [14:37] <mgottschlag> okay, everybody, could we please go back to normal business here? [14:38] <ShiftPlusOne> Yeah, I think I am going to start kicking people that won't move on. [14:38] <A124> ShiftPlusOne: Good idea. [14:39] <ShiftPlusOne> So ahm, how about that weather, ey? [14:39] <gordonDrogon> still raining here. [14:40] <neilr> mmm, looking at that, there's nowhere near enough tea drunk today. [14:41] * Hodapp follows neilr with some Earl Grey in his hand. [14:44] <Hodapp> I've mostly been drinking green tea. [15:07] <gordonDrogon> Hm. might not be chod's board afterall..
[15:17] <buzzsaw> called the company. Oh here we have you in the system but you have not placed any orders with us. [15:18] <nid0> time to place that order then! [15:21] <IT_Sean> If they aren't showing an order in their system, i wouldn't hold your breath waiting for one to arrive. [15:21] <buzzsaw> I have not purchased a SD card in quite some time, where is the best place to get them for inexpensive now days? [15:21] <gordonDrogon> as long as thery only take payment once! [15:30] <gordonDrogon> Hm. those mcp23s17's are more cunning that I first anticipated. [15:31] <ShadowJK> the pi power port is microusb, right..
[15:31] <IT_Sean> ShadowJK: yes, it is. [15:31] <ShadowJK> IT_Sean; Model B ver 2? [15:32] <neilr> A124: Yes, fair point - I use an external HDD just because I had one spare. [15:33] <IT_Sean> ShadowJK: the shop was probably trying to rip you off by selling a more expensive one. MicroUSB is MicroUSB is MicroUSB. [15:37] <Zencrypter> Has anyone of you tried Barracuda Drive ? [15:37] <nid0> as in, ever? [15:42] <Zencrypter> bacteu, What do you mean? [15:43] <Zencrypter> nid0, Can we tell barracudadrive which port to use ? [15:44] <buzzsaw> does class 4 vs class 10 matter? [15:44] <Zencrypter> nid0, A kind of "listen 80" :?? [15:48] <Zencrypter> > ISHYGDDT :?? [15:51] <Zencrypter> nid0, "Forwarding Nginx on Barracudadrive"
[15:52] * ShadowJK likes the flashcardsurvey page at linaro.org/ somewhere..
[15:55] <gordonDrogon> dreamreal, you just got to trust the numbers unless you have a 'scope. [16:02] <buzzsaw> anyone know a good mcm part number for a powersupply? [16:11] <buzzsaw> what does the Pi draw? [16:12] <IT_Sean> buzzsaw: the Pi requires a supply capable of a minimum of 750mA. 1A is recommended. [16:13] <ShiftPlusOne> if you don't plug in any usb devices, it should be fine. [16:14] <buzzsaw> ShiftPlusOne: I will be running a wifi card. [16:15] <IT_Sean> You may need a powered hub for that. [16:15] <ShiftPlusOne> nuh, probably no hub needed, just make sure to plug the card in before powering the pi. [16:16] <IT_Sean> Depends on the wifi thumb. [16:16] <IT_Sean> Some will work right off the Pi. [16:18] <bacteu> buzzsaw: is that one of the big high watt ones? [16:19] <Zencrypter> There are two 1.2A charging ports. [16:20] <buzzsaw> bacteu: have you used it for wireless sniffing? [16:22] <bacteu> buzzsaw: what legitmate uses are there for wifi sniffing? [16:31] <buzzsaw> IT_Sean: have you done it with a rpi yet? [16:32] <buzzsaw> I am interesting in knowing how well a wifi card works in rfmon :-) can it cycle fast enough to pick up probe requests? [16:34] <humle85> buzzsaw hi bro, have your tried it out the Kali on rpi? [16:36] <humle85> where did you place the order? [16:37] <humle85> where in UK ? [16:49] <buzzsaw> sure you can... but thats not what I am saying. [16:50] <bacteu> buzzsaw: No, you can't. [16:54] <bacteu> ReggieUK: The discussion involves raspberry pies, it is entirely relevent. [16:54] <bacteu> ReggieUK: So, no. [16:55] <IT_Sean> bacteu: you were told by a #raspberrypi channel operator to drop it. [16:55] <bacteu> IT_Sean: Is that supposed to mean something? [16:58] <IT_Sean> bacteu: yes. It is. If a channel operator tells you to drop a conversation, you are expected to obey that instruction. [16:58] <gordonDrogon> there are better places than here to talk about pentesting, etc. even on a Pi. [16:59] <bacteu> IT_Sean: Quite the ego. [17:04] <buzzsaw> thats okay i guess... I can play witht he gipo stuff. [17:06] <neilr> Here's a question for a Friday afternoon... I'm planning a new office for myself as part of some building works. Want to use a pi for controlling heating. Any other things I can automate with it? [17:07] <IT_Sean> you are really only limited by your imagination, and your electronics skills. [17:08] <neilr> Well, it's just for playing really - I have a few kicking around, that's all. [17:08] <gordonDrogon> electric or gas heating? [17:09] <gordonDrogon> if electric then you'll need big relays or solidstate equivalents. [17:11] <neilr> Well, yes, I *can* use wireless, but when the pi is about 15cm from the switch it makes little sense! [17:12] <neilr> mmm, how about a solar panel on the roof, mounted on a rotating pole to follow the sun across the sky? [17:12] <gordonDrogon> neilr, what kind of heaters - electric fan? [17:12] <neilr> Assuming we ever see any sun. I know I'm being optimistic. [17:12] <gordonDrogon> sun? what's that..
[17:13] <gordonDrogon> it only needs a couple of watts. [17:13] <gordonDrogon> to move a panel. [17:13] <neilr> Oh, I know I could just leave it in one place. But where's the fun in that? [17:14] <gordonDrogon> someone's got a quad flying via a Pi. [17:15] <gordonDrogon> buzzsaw, arducopter, etc. all good stuff. I had a project 18 months ago to do stuff like that. [17:16] <buzzsaw> but... will have a change of jobs soon so. [17:18] <gordonDrogon> buzzsaw, it's slightly more complicated than that, however... that's the essence. [17:18] <gordonDrogon> my project had 8 motors. [17:18] <gordonDrogon> or would have had if the people funding it had stumped up the cash. [17:19] <buzzsaw> why 8 over 4? [17:20] <neilr> Oooh, that's cool. I like that. [17:21] <gordonDrogon> buzzsaw, we needed to be able to cope with failure of any one motor and possibly 2. we were looking at a 6 motor and 8 motor platform. the payload was several Kg. [17:22] <IT_Sean> "several"? 3? 10? 15? 20? [17:22] <gordonDrogon> several 1000? of expensive camera kit, etc. [17:27] <gordonDrogon> RiXtEr, yes, but not transparently (yet). it's actually on my to-do list for wiringPi, but if you're writing your own software then you'll need to communicate between the Pis - somehow. 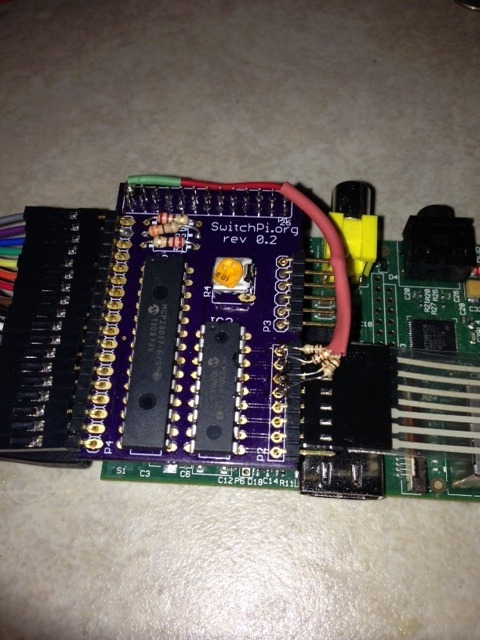 [17:28] <gordonDrogon> RiXtEr, it might be easier to use one Pi with one of the GPIO expansion chips - e.g. mcp23s17, etc. [17:39] <RiXtEr> gordonDrogon, how many gpio's does that actually add ? [17:40] <Twist-> RiXtEr: sounds like a job for shift registers. [17:41] * RiXtEr googles for shift registers. [17:45] <gordonDrogon> RiXtEr, 16 additional with the mcp23017 or 23s17. [17:45] <gordonDrogon> using mcp chips both SPI and I2C you can add on an additional 384 GPIO pins - easily. [17:46] <gordonDrogon> shift registers are good, but can be fiddly and are (mostly) output only. [17:47] <gordonDrogon> when I release wiringPi v2 it will make light work of them though. [17:51] <buzzsaw> so is controlling i/o on the pi difficult? [17:51] <Twist-> gordonDrogon: neat. I didn't know about these. [17:54] <gordonDrogon> in my wiringPi world, I've reduced everything I know about to a simple 'pin' type definition. [17:54] <gordonDrogon> and you just digitalWrite () to any bit in that shift register and the stuff underneath takes care of it for you. [17:55] <buzzsaw> similar to whats done with an arduino. [17:55] <buzzsaw> thats kind of what I was wondering. [17:56] <buzzsaw> why is that? [17:56] <gordonDrogon> the underlying Pi hardware has dynamic RAM and a GPU. [17:56] <gordonDrogon> the GPU refreshes the RAM and updated the video. This steals time from the ARM. [17:56] <K4k> Hi, when I boot my pi I get the following message: "PANIC: no init found. Try passing init= option to the kernel" I'm running rasbian wheezy. [17:57] <gordonDrogon> I can do 18,000 1mS times without any issue though. [17:57] <gordonDrogon> K4k, sounds like you've lost the root filing system - sd card corruption maybe. [17:57] <SpeedEvil> gordonDrogon: without one hitting 3ms? [17:57] <K4k> gordonDrogon: I thought so too so I plugged the card into my laptop and I can still read the card just fine. I ran fsck on the card, it found and corrected several errors. [17:58] <gordonDrogon> SpeedEvil, you can never be certian with Linux, but for the most part, yes. [17:58] <gordonDrogon> K4k, see if /sbin/init exists though. tht's what it's looking for. [17:58] <gordonDrogon> SpeedEvil, you run a thread in realtime & high priority. [17:59] <gordonDrogon> the main issues I have is sub 100?S timings. [17:59] <K4k> gordonDrogon: yes, the file exists. Should I be able to view it in a text editor or is it a binary? [17:59] <gordonDrogon> and then I can do it mostly accurately, but it runs the cpu in a busy loop. [17:59] <gordonDrogon> K4k, it's binary. [18:00] <gordonDrogon> buzzsaw, I use arduino for more accurate stepper motor control - for now. [18:00] <K4k> gordonDrogon: would it be worth trying to specify init=/sbin/init in config.txt? [18:01] <gordonDrogon> K4k, maybe, but that's what it looks for anyway. however it could be that it's looking for a library that now doesn't exist. [18:02] <K4k> Any chance you know what those are so I can look for them? I am only asking because I'm confused that this keeps happening every few weeks. I have a very well known brand, C10 SD card so I would be very surprised if it is bad already seeing as how I haven't had it all that long. [18:05] <gordonDrogon> thos are the ones that have 'hit' me in the past. half decent PSU and no overclocking and I've not had an issue for 6 months or more now. [18:06] <K4k> gordonDrogon: I had it overclocked when I was running Arch, and that did cause some issues so when I re-built with rasbian I left it at stock speeds. [18:06] <K4k> The PSU I'm using seems to be well within the recommended specs and is not a cheapo brand from ebay or something. [18:09] <buzzsaw> for the psu is it dirty electricty that causes it? [18:10] <gordonDrogon> there was a good review/rant on the eeeblog about one a while back. [18:10] <buzzsaw> has there been much attempt to add a touchscreen to the rpi? [18:10] <whyrusleeping> Is there a way to set up a pi to mirror the screen of a windows machine over a network? [18:11] <buzzsaw> whyrusleeping: what do you mean? [18:11] <whyrusleeping> buzzsaw: even on a windows machine? [18:12] <K4k> whyrusleeping: the only application that does anything like that that I can think of is called synergy, but that doesn't share screens, just keyboard and mouse. [18:12] <gordonDrogon> K4k, I don't know - I've been lucky - my HTC one works OK, my Jawbone one works OK - if I don't OC, my laptops & PC works fine too. [18:12] <gordonDrogon> buzzsaw, I have a touchscreen connected to a Pi. [18:13] <gordonDrogon> buzzsaw, experimental. very small too. mobile phone size. [18:13] <gordonDrogon> buzzsaw, not a product yet. [18:13] <gordonDrogon> buzzsaw, are you looking for a framebuffer type touchscreen? [18:13] <gordonDrogon> or just something you could dedicate to a project? [18:14] <gordonDrogon> that's a product. [18:16] <buzzsaw> so not a desktop but more of a control pad. [18:21] <gordonDrogon> you need to program them from an app. that runs under Windows though, but once programmed it's a simple high-level set of functions to access it. [18:25] <gordonDrogon> I was lucky I had an old laptop with Win XP on it to genrate the displays! [18:25] <gordonDrogon> right, I have to pop out for an hour or 2. back later! [18:25] <buzzsaw> how much does that display run? [18:38] <pierut> has anyone had gpm functioning properly on archlinux? [19:01] <IT_Sean> you need a /join before that, cheese. [19:26] <phw> I want to use this rainbow cable: http://www.c-u-s.co.uk/images/uploads/RASPBERRY_PI/GPIO_Cable/RPi_GPIO.JPG ; Is the upper calbe is brown (nearest to the outside of the rpi. is this pin 1 or pin 2? [19:28] <converge> I need to set up a basic firewall on my business, is it a good idea use something like a raspberry pi firewall to control 20 computers ? [19:29] <IT_Sean> you do know that the raspi only has one network interface, right? [19:30] <IT_Sean> You could do that, but the performance is less than ideal for a production environment. [19:30] <buzzsaw> converge: why not get a proper firewall? [19:31] <converge> buzzsaw: trying to find new/cheap ways to do basic stuffs..
[19:33] <buzzsaw> converge: check this out http://www.microcom.us/erlite3.html $100 and its quite configurable. [19:34] <IT_Sean> converge: the raspi is not going to be "high performance" as a firewall for 20 computers. [19:38] <converge> has openwrt a built in firewall ? [19:38] <converge> can I set iptables rules using openwrt ? [19:55] <kaste> Does anyone here use u-boot as a boot loader? [20:11] <A124> gordonDrogon: Hey. Anyway. I realized, if you state that "this is a friendly channel", why don't you friendly tell me that I should not say that here. But intead "giving me a warning" using advanced English, that can be not understood by all and als threathening me in a a way. To quote you: (14:27:13) gordonDrogon: A124, this is a family friendly channel and that gets you a warning. [20:11] <A124> Just to say. You were speaking against your own wordl. [20:11] <IT_Sean> We never said we were friendly. We said we were family friendly. [20:12] <dreamreal> still on that. There're lots of channels with people who're easily offended like that. I don't understand it, myself. [20:12] <A124> IT_Sean: Does not change a thing if it represented like that. [20:13] <A124> dreamreal: If you are talking about me, you are oftc. [20:13] <IT_Sean> off topic is fine in #raspberrypi. [20:14] <IT_Sean> 8-% of what goes on in here is, to some degree, off topic, at times. [20:15] <dansan> So if a raspberry falls in a forest, and nothing his hooked up to the GPIO to tell it that it fell, will it still short out on the damp peat of the forest floor? [20:15] <dreamreal> dansan: only if there's an observer who thinks it might not happen. [20:16] <IT_Sean> dansan: no, but it will still void the warranty. [20:17] <buzzsaw> dansan: is that like Dr Who and the angels? [20:17] <dansan> hah! good one ! [20:17] <buzzsaw> they no longer exsist when your looking at them? [20:17] <IT_Sean> dansan: the best consumer source for mouse optics is probably from older optical mice. [20:18] <dreamreal> dansan: just nod wisely and say "yes, well, the tardis... hold on while I get my universal screwdriver." [20:20] <dreamreal> but what prevents its use on linux? [20:22] <dansan> The userspace is primarily what? OH! GNU! [20:22] <dansan> No it isn't. Linux is a kernel. [20:29] <dansan> No, it wront 2303482% of it all! [20:34] <dansan> What!? OMG! GNU seeks no pitty! [20:34] <dreamreal> It can have all the pitty it wants. No pity, though. [20:35] * dreamreal gets pithy. [20:35] <dansan> Gee, I wonder which compiler Debian uses. Oh yeah! It's the GNU Gcc!!! [20:37] <dansan> You work at Redhat? [20:40] <dansan> you mean the terminal bell? character 0x0a? [20:40] <dreamreal> so how do you build a "complicated red-black"? [20:41] <dreamreal> so what's this about a complicated red-black algorithm? What's it for, what makes it complicated? [20:43] <dansan> Oh! even better, I could have said "Our Lord and Savior, Richard Stalman.. for thout name art holy and stuff"
[20:43] <dreamreal> blah blah blah. So the only thing necessary would be that the nodes be comparable somehow. [20:43] <dansan> Basically, I applied C++ metapgramming principles to C in a way that many conventional C programmers hate (they call it dead-code tricks). [20:45] <dansan> dreamreal: yeah, accessing the keys from a user-defined struct and comparing them. As well as other stuff like "does your tree allow duplicate keys?" and "Should your insert replace if it encounters an existing key or fail?" and also, "do you think that GNU should be an icecream flavor"
[20:45] <MrKeuner> hello, would like to install XBMC on my rasbian. Following this doc: http://www.raspbian.org/RaspbianXBMC I do not seem to have rpi-update, what is the proper way to get it? [20:46] <gyeben> why shouldn't he use rpi-update? [20:46] <MrKeuner> what's wrong with rpi-update? [20:48] <gordonDrogon> I haven't used it myself for some time though. [20:48] <gordonDrogon> Ah, Mr. chod .... you there? [20:49] <chod> is my board fscked? [20:51] <QazzaQY2K> hey guys.. I'm playing with a pre installed wordpress image.. when I try to access it through my WAN ip it looks for the old LAN ip as used when it was installed.. now I'm wondering how can I change the configured ip? [20:51] <gordonDrogon> chod, I have a patch to wiringPi v2 if you'd like to test it..
[20:53] <dreamreal> chod: very "under"
[20:53] <gordonDrogon> chod, if you fetch http://unicorn.drogon.net/wiringPi-2.1.tgz and unpack/install it, then run that program ..
[20:53] <gordonDrogon> dreamreal, I've worked for 2 supercomputer companies in the past... fascinaiting stuff at the time. [20:54] <dreamreal> gordonDrogon: which ones? [20:54] <gordonDrogon> dreamreal, Meiko and ClearSpeed. [20:54] <QazzaQY2K> anyone good with wordpress? [20:55] <gordonDrogon> dreamreal, never heard of them I'm afraid. [20:56] <gordonDrogon> dreamreal, Meiko built systems out of Transputers, i860's and Sparcs. ClearSpeed developed a co-processor. [20:58] <gordonDrogon> 20 years ago. [20:58] <dansan> probably hard to hold that title for long though huh? [20:59] <gordonDrogon> https://projects.drogon.net/a-box-of-200-raspberry-pis/ <- has a picture of it. [21:01] <gordonDrogon> dansan, don't feel too bad - my own telephony business didn't work out too well! [21:03] <buzzsaw> gordonDrogon: which screen did you use in your demo? [21:04] <QazzaQY2K> Hey anyone got a sec? I'm trying to figure out something..
[21:06] <QazzaQY2K> When you install wordpress the last configure part, it some how stores what your local LAN IP is. I've changed my LAN IP, but it still asked for the old one. Now where would I find this configured IP and change it. [21:06] <QazzaQY2K> ParkerR: ty, I did a few rows up. No one saw it or something. [21:17] <chod> image not written ? [21:18] <chod> did u see what it was stuck on? [21:18] <IT_Sean> did you tre-try it in the Pi? [21:18] <IT_Sean> Indeed... it may need re-imaging. [21:19] <chod> got a spare card you can try? [21:21] <chod> power supply ok? [21:21] <chod> have you much plugged into usb? [21:23] <K4k> what has to be written to the card during shutdown in order for it to come back up properly? [21:23] <K4k> or is it just a matter of being unmounted cleanly? [21:24] <chod> i just pull the power sometimes and 'usually' its fine here. [21:43] <gordonDrogon> personally I think sudo is bad as it lets you run root stuff without the need to su with password first, but maybe that's just me. [21:44] <gordonDrogon> K4k, do you have any others? [21:44] <mgottschlag> hm, if the rootfs is mounted read-only, then pulling the power cord shouldn't have any effent on the integrity of the system, right? [21:44] <mgottschlag> is there any way to make the file system 100% resistant to power outages even when mounting a filesystem (somewhere, maybe on external storage?) as read-write? [21:45] <gordonDrogon> mgottschlag, there is a flash based file system that's supposed to be good for that, but I can't for the life of me remember its name right now. [21:46] <A124> mgottschlag: gordonDrogon: jffs? [21:46] <IT_Sean> how many Pis have you killed, gordonDrogon ? [21:46] <gordonDrogon> IT_Sean, remarkably, none so-far. [21:46] <IT_Sean> not even that one? the 3.3v short boot loop one? [21:47] <gordonDrogon> don't seem to have blown up an mcp23017 either despite me making them get very hot..
[21:47] <gordonDrogon> mgottschlag, I built a series of routers and PBXs that booted into RAM and ran from there... they were pretty good at having the plug pulled. [21:47] <gordonDrogon> IT_Sean, I can give you 2 gpio commands that'll reboot a Pi - most of the time..
[21:48] <gordonDrogon> mgottschlag, that was the issue for me - voicemail storage and "settings". [21:49] <Mement> Can I plug the Pi in my desktop with the USB cable and play around with the system in a Virtual Machine? [21:51] <IT_Sean> K4k: is correct, Mement. You cannot interface between your Pi and your PC in the way you are thinking, but you can set up an entirely separate VM. [21:51] <Mement> IT_Sean - K4k : My 'project' is to create an small ftp/host with the Raspberry. [21:51] <IT_Sean> you can do that on a raspi. [21:52] <IT_Sean> The RaspberryPi is just a small, low power computer. [21:52] <Mement> So basically want to set up a SSH connection and continue with my desktop setting up the RaspBerry Pi. [21:52] <IT_Sean> you can SSH into the Pi once it is booted, yes. [21:52] <buzzsaw> IT_Sean: some one asked before, does sshd start on first boot? [21:53] <Mement> Ok, but it is recommended to first enable incoming connections on the Pi itself, rather than do it through connecting with USB and set up with Virtual Machine. [21:53] <IT_Sean> Mement: you CAN NOT interface with the Pi via USB from your PC. [21:53] <IT_Sean> you will have to connect over the network. [21:54] <K4k> nid0: with rasbian you have to enable it in the install screen. [21:54] <gordonDrogon> sshd nornally starts with Raspbian. [21:54] <A124> nid0: Interesting, I'll take a look into it next install. [21:54] <IT_Sean> You are welcome Mement. [21:55] <K4k> I'm just basing my (probably ignorant) assumption on the wording of the question at the end of the install menu. [21:58] <A124> The database has encountered a problem. [21:59] <chod> gordonDrogon: obviously your terminal window commadns work fine, is there docs for the extended syntax or latrer? [22:06] <gordonDrogon> chod, sorry - what extended syntax? not sure what you mean here..
[22:09] <gordonDrogon> but the syntax will be documented - soon! [22:10] <gordonDrogon> yes. the first number will always by the pin base. [22:10] <gordonDrogon> the others will depend on the actual module. [22:11] <chod> with gpio -c mcp23s17:116:0:1 mode 116 out ? [22:11] <gordonDrogon> e.g. the mcp23017 (i2c) one is just mcp23017:base:i2cAd ..
[22:11] <gordonDrogon> yes, that works. [22:11] <gordonDrogon> for your 2nd chip. [22:12] <gordonDrogon> back in 5 mins..
[22:24] <gordonDrogon> writing some documentation now! [22:26] <gordonDrogon> no - it's pretty much stateless between calls. [22:26] <gordonDrogon> the only thing it can read-back is the on-board gpio with the 'readall' command. [22:36] <buzzsaw> gordonDrogon: the demo you showed with the touch screen. would it be asking to much to create multiple screens to swipe between? [22:40] <gordonDrogon> buzzsaw, the display can handle multiple screens. [22:41] <gordonDrogon> you don't 'swipe' though - either the Pi sends a command to the display that tells it which page to display, or the display itself can handle it without the Pi being involved. [22:42] <gordonDrogon> there are quite a few different demos there. [22:43] <buzzsaw> the visigeni (sorry not tuned to the accent yet) is that free? or paid? [22:43] <gordonDrogon> skip forward to about 24 minutes. [22:44] <gordonDrogon> the software is free. [22:47] <phw> I am using a ribbon cable like that one: http://www.c-u-s.co.uk/images/uploads/RASPBERRY_PI/GPIO_Cable/RPi_GPIO.JPG ; What cable equals which pin? [22:47] <gordonDrogon> they're fun - not general purpose in that it's not that easy to do your own thing on it - they're really designed to take the load off the host computer though. [22:48] <gordonDrogon> phw I would guess that the white wire is pin 1. [22:48] <gordonDrogon> but it depends on which way round you put it on the pi. [22:49] <gordonDrogon> So if you put it on the pi facing away from the pi, and not over the top then it looks like white is 1, black is 2. [22:49] <gordonDrogon> so white would be 3.3v, black would be 5v. [22:49] <gordonDrogon> brown would be 0v. [22:49] <gordonDrogon> that would be easy to verify with a multimeter. [22:50] <gordonDrogon> buzzsaw, yes - the backlight takes the most juice. [22:55] <gordonDrogon> aaa801, however... I have used a flat-bladed screwdriver in the past. [22:55] <gordonDrogon> oh, use a stanley knife. [22:56] <gordonDrogon> phw if you have an LED and resistor, you could use that to check too. [22:56] <aaa801> continuity test right ? [22:56] <designer43> Camera ETA known? [22:57] <gordonDrogon> aaa801, ah, ok, yes, that'll work. [22:57] <phw> gordonDrogon: Seems to work - very much! [22:58] <gordonDrogon> aaa801, right - re-reading your stuff. use a flat bladed screwdriver - push it from the side of the copper into the hole. [22:58] <gordonDrogon> repeat on both sides - you might have some shards of copper which you can break off. [22:59] <gordonDrogon> aaa801, http://www.maplin.co.uk/spot-face-cutter-1926 is similar to what I have. [22:59] <gordonDrogon> mgottschlag, how much current? [23:03] <gordonDrogon> I^2 R loss. [23:04] <mgottschlag> thx - is there any resource for such knowledge? [23:05] <gordonDrogon> but ever cable company has its own tables. [23:12] <gordonDrogon> anyone here going to the maker faire in Bristol tomorrow? [23:14] <gordonDrogon> I think it's the cache. [23:16] <gordonDrogon> ah well, I'll look later. [23:16] <gordonDrogon> zed time now - 2 hour drive to bristol tomorrow. [23:16] <chod> a pi jam in bristol? [23:18] <gordonDrogon> chod, no it's a maker faire. [23:18] <gordonDrogon> Amadiro, bit far for me! [23:19] <Amadiro> gordonDrogon, too bad, I'd have bought you a beer. [23:24] <stapper> Is there a known DSI screen for the port on the Pi that will work "out of the box"
[23:30] <r0b0ty> Hi guys. Just got Rpi up and running. Is it safe do an 'apt-get upgrade' as in standard Debian OS? What's the norm? [23:37] <r0b0ty> Cool, thanks dudes. [23:48] <r0b0ty> A124: I'm currently running the apt-get upgrade... do you suggest running the dist-upgrade after?